Home Fitness Is Ultrarunning the New Marathon? How to Transition from Half Marathon to An ULTRA! Is Ultrarunning the New Marathon? How to Transition from Half Marathon to An ULTRA! Running has caught on big time. A few years back, “I run” was enough to get that adulation and admiration from your friends and colleagues. However, now – “I just ran a 21k this morning” or “I did my first marathon in under 5hours” no longer sound that impressive. Its only when you drop the big word “Ultrarunning” in your conversations that others start to notice!! So, what’s going on? One, the human species have always craved for attention – do something different, stand out and so while the crowd does the HM and marathon, one stands out by doing an Ultramarathon. Two, most of us who start out with a 10k or 21k, progress to a 42k and become faster at these distances, hit a plateau and look for a new challenge – “if I can’t run faster, can I run longer?” And that desire to test out, to challenge oneself makes them go looking for an ultra event. Whatever be the motive, a transition from a marathon distance to an ultra distance needs patience, a change in training and a very different approach in planning out the race. More than anything else, the mind needs to be trained as much, if not more, to tackle the longer distances. I moved from a 10k distance to a 50k race in the first 2 years of my running life – it was my way of challenging myself. I have only done half marathon distance so far, should I attempt an ultra ? I have never said No to that question. Its possible. I know of many a runners who did their first ultra without officially doing a marathon (met one recently at Bangalore Ultra who did a 75k and the longest run he had done was a 36k – in training!!) Remember for any run what matters is the training plan and what your objective for that run is. If you are a half marathoner, I would strongly suggest not doing more than a 50k as your first ultra – pick up a training plan which gradually moves you from 21k to a 40k distance, build a strong base mileage, rest and recover well and focus on finishing the race more than the timing. Should my first ultra be a road or a trail ultra, loops or point to point ? Ultras are usually associated with trails. There are road ultras as well, so if you are not a trail person – pick a road ultra if you can. If that’s not a choice, then pick a trail ultra which is not too technical – no difficult stony patches, steep inclines or real wild stretches. For the first time, you will be on your feet for a very long time and easier the track, better it is. Similarly, choose an ultra with loops. You will see your fellow runners often enough, you will have easy access to your own bags and usually these ultras have aid stations every 2-3km and one doesn’t have to worry about carrying hydration and nutrition. What about long runs in training ? Now for us city dwellers where our entire running happens on roads, two or three hours into our runs, besides everything else that hurts and irritates, the road traffic becomes a big nuisance. So we have to be really smart about the long runs. As part of my Comrades training, I have done 60km training runs and interestingly the first year was loops inside a Gurgaon locality at night and the second year a run from Dehradun to Mussoorie and back. However, for my other ultras I have trained by doing 10 day streaks, back to back long runs on weekend (also doing an evening run if I could) and both have worked. I prefer the second method – primarily as it helps in a faster recovery. But the advantage of the longish run is the confidence it gets you having done a reasonably long distance run. Another very important thing to keep in mind for long runs is to practice taking walking breaks. Most of us run our shorter distances with no walking breaks. And so during the long runs, practice the discipline of taking timed, short walking breaks. Its important to learn how to pace so that you don’t burn yourself out in the later part of the race. Do I need a special diet during training ? Yes and yes. Recovery during an ultra training is not only through the stretching and rest we do, its also recovering in the mind (I will cover that later) and recovery through the right kind of diet. You need to eat to make up for the calories spent and to help muscles recover from the stress. I am not a protein shake person – so I add a lot of chicken, paneer, soya milk, nuts – walnuts, almonds, to my diet. I have recently started taking Spirulina as a protein supplement. Any special gear for the run ? if you are familiar with chafing, then you know choosing the right clothing for the ultras is very important. Vaseline will be your best friend. There are special trail shoes – but unless you are doing technical trails or doing the desert series, the normal road running shoes work. Choose a comfortable hydration pack if you are the kind to carry your own water. How do I keep myself motivated during the training period ? Ultra training can be a big boring job. The whole process of planning, running and recovering from the run can become stressful for anyone. Ask your friends to join you for the runs – run with you or cycle along. Remember your training runs for an ultra are lot easier – no time targets, no burning your heart out runs. Enjoy the runs. Imagine yourself at the finish line. Get your family involved – to help you with your daily chores, keep you motivated. Talk with friends and family and distress mentally. Will it hurt ? Oh Yes!!! Bloody well it will hurt !!! The training runs will hurt, your ultra race – where most likely you will be doing that distance for the first time – will hurt. You will for the first time discover parts of your body you never knew existed – because they suddenly start to pain and ache. I recently did my first 100k distance and despite following my training plan well, I still didn’t register till 10 days before the race, because I was afraid – afraid of the pain I will have to go through. So my advice – if it pains continuously, Stop. Check for an injury. And on the race day – to manage your pain, “Smile”. Its difficult and so “fake it till you make it”. Nutrition and hydration on the race day – For any race, one, reach the start line injury free even if it means undertrained and two, make sure you have your hydration and nutrition plan in place and go as per that strictly. These two cardinal rules are all the more important for the Ultra races. Try out your nutrition plan during your training runs and write it down if you have to for your race day and stick to it. No compromises. People often ask me “Why do I run Ultras?” Each of my Ultramarathon races have been an exciting adventure for me – they have made me realize the strength, determination and the will, that exists in me, to conquer the impossible. The high of crossing the finish line is worth the pain or the discomfort that I have gone through in those 12 / 13 hours that I have been on the track. It’s funny and ironic that something which causes you immense pain, also gives you the most pleasure. So, don’t be intimidated by the word “ultra” – channelize your energies and your passion to take on the distance – and join the crazy gang of ultramarathoners!! Rashmi started running 8 years back to get away from the stress of increased demands in managing a career, a family and other worldly duties. 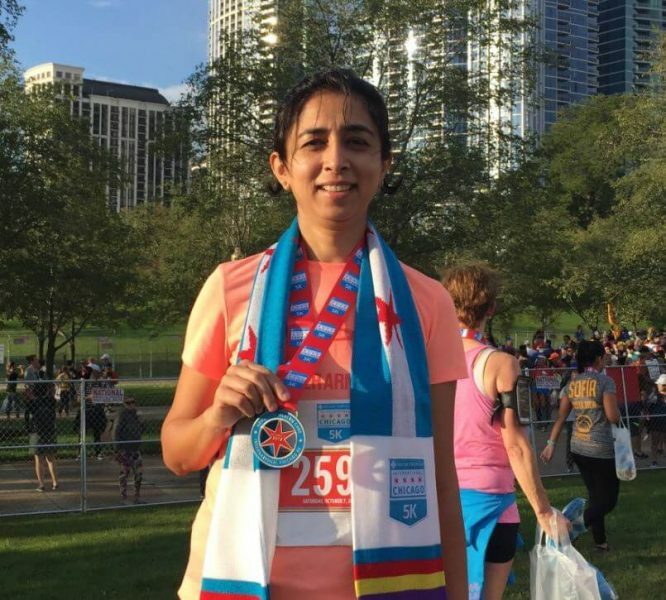 She credits her running for keeping her sane but what started as a stress buster, has made her do many a half marathons, a few marathons and some Ultras. Her first Ultra run was a 50k run in 2011. She has done back to back Comrades Ultramarathon in 2014 and 2015. She has also done 80k and 50k distance at Bhatti Ultra. She recently did her first 100k run at Bangalore Ultra and looking forward to some more ultra adventure.